Super Smash Bros. Melee has been played competitively since its inception in 2001 (although it started with a relatively low popularity until 2003), and it continues to thrive in the competitive scene to this day. The scene has gone through several "eras" of smashers, the "Golden Age", "era of The Five Gods", "the Platinum Age" and "Chaos Era." While Smash Bros. has been viewed as a "casual party game" by Nintendo, Masahiro Sakurai (the series' main developer), and the general public, this did not stop fans from playing the game at a competitive level. Following Melee's release in 2001, avid players started to utilize the game's unique physics engine to generate unexpectedly fast movement across the stage, which had never before been seen in the Smash series. As players began perfecting newly discovered techniques such as wavedashing, dashdancing, and L-canceling, many smashers began hosting small tournaments for the first time; these tournaments were usually held among small groups of friends in basements or video game stores. However, Matt Deezie is credited as the founder of the competitive Smash scene, when he began hosting the Tournament Go series in Northern California, in April 2002. Tournament Go helped bring to attention a standard, unified ruleset of legal stages and tournament procedures, and generate increased competitive interest in NorCal and across the United States. By the time the tournament series concluded with Tournament Go 6 in 2004, Matt Deezie had hosted the first 100-man tournament with the best players from all corners of the United States, such as Ken, Azen, and ChuDat, in attendance. Meanwhile, other large nationals such as MELEE-FC and Game Over sprung up in different regions of the country. This initial surge of tournament activity paved the way for increased support from large video game organizations, such as Major League Gaming, into the young Melee scene. 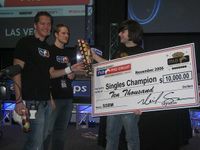 PC Chris after winning MLG Las Vegas 2006. The Golden Age of Super Smash Bros. Melee kicked off with Major League Gaming's addition of the game to its largest tournaments, such as MLG New York 2004. Following large public interest in these early events, MLG began expanding its presence in the Melee scene, featuring the Nintendo game at more and more of its big events. Ken, Azen, ChuDat, Isai, PC Chris, and KoreanDJ competed with a rising star in the form of Mew2King for the top spots at MLG tournaments in 2005 and 2006; Ken was notably dubbed the "King of Smash" for his incredibly consistent level of dominance at these events. Major League Gaming's professional sponsorship resulted in large prize pools compared to the number of competitors (PC Chris won $10,000 for his victory at MLG Las Vegas 2006), creating a solid foundation for the nation's top players and the competitive community as a whole. While MLG dropped Melee from its tournaments in 2007, EVO, another large fighting game tournament series, added the game to its roster the same year, generating new waves of excitement and interest in the competitive community. Although Smash Bros. had continually been criticized and shunned by the rest of the fighting game community for its unorthodox gameplay and perceived "casual" appeal, it had still made it into the largest video game tournaments through the dedication and persistence of the grassroots community. Following Ken's retirement from the game in 2007, a new challenger, Mango, began to dominate Melee tournaments along with Mew2King, setting the stage of the competitive era in years to come. A photo of the crowd reaction during the grand finals between Mango and Armada at GENESIS, the largest tournament of 2009. After Nintendo released its newest Smash Bros. game, Super Smash Bros. Brawl, in March 2008, Melee players questioned the survivability of their game as much of the community moved on to the new title. These fears turned out to be true, as 2008, commonly known as the Dark Age of Melee, became completely dominated by the Brawl scene; not a single Melee major was held for around a year, and the few small tournaments held registered paltry attendance numbers compared to those of just the year before. The Melee scene remained stagnant until Alukard held Revival of Melee in Nanuet, New York, in March 2009. This tournament was the first American event to feature Melee's best players from across the country (such as Mew2King, Mango, PC Chris, and Azen) since Pound 3 in February 2008, and was the beginning of a gradual revival in tournament attendance back to pre-Brawl levels. The renewed surge in attendance was aided by the fact that many Melee players disliked the slower, less combo-oriented gameplay of Brawl and returned to the former game shortly after its release. While EVO and Major League Gaming added Brawl to their major tournaments, the Melee community held on through a strong grassroots presence. Melee players' desires to remain a strong presence in the Smash scene led to the hosting of bigger and bigger tournaments, including GENESIS and Pound 4, and Melee was able to maintain tournament numbers similar to those of Brawl, even though the 2008 game attracted more newer Smash players than its predecessor. Following the declining activity of Melee's strongest players, such as Ken, KoreanDJ, Azen, and PC Chris, the tournaments of this age have been dominated by The Five Gods: the five very best players of Super Smash Bros. Melee throughout this time period. These five players, Armada, Hungrybox, Mango, Mew2King, and PPMD, have consistently dominated tournaments from around 2008 to the present, while rarely losing tournament sets to players that aren't among the gods themselves. These five players won every tournament where at least two of them were in attendance from 2008 to 2015, except for Don't Go Down There Jeff, where Mango sandbagged for part of the tourney. Mango celebrates his victory at EVO 2013. Samox's documentary The Smash Brothers helped lead to a huge increase in Melee's popularity. The era of Melee since 2013 has become known as the Platinum Age, and has been characterized by an explosive spike in attendance numbers to a level never seen before, and another transition from a largely grassroots scene to an increased connection and involvement with the rest of the eSports community. EVO 2013 was the tournament that sparked the massive growth of the Melee scene. After EVO's announcement of a donation drive to feature an eighth title at the world's largest fighting game tournament, Melee It On Me and other groups organized efforts that raised nearly $95,000, allowing Melee to become the final featured game at EVO. Hosted from July 12th-14th, 2013, EVO drew a staggering 709 entrants, becoming the largest Melee tournament of all time. The tournament surpassed Pound 4, the previous record holder, by twice as many entrants, and was the third largest game at EVO, even though it hadn't been featured in the series since 2007. This landmark tournament, coupled with the October 2013 release of Samox's The Smash Brothers documentary, which detailed the history of the competitive Melee scene, is often attributed with creating a rejuvenated interest in the Melee scene that continued to break new grounds. Apex 2014 again topped the 600-entrant mark in January 2014, and the number of majors held sharply increased, but the biggest highlight of the year was the "Summer of Smash": Melee was to be featured at three of the world's largest fighting game tournaments in June and July. MLG Anaheim 2014, held from June 20th-22nd, marked the return of Smash Bros. to the stage of Major League Gaming after four years; this major was followed up by Melee's appearance at CEO 2014. EVO 2014 continued to surpass expectations of the previous year's event by attracting nearly 1000 entrants, raising prospects over the potential of a game over a decade old. The excitement and energy generated by these three tournaments led to increased attention from the eSports scene as a whole, despite the fighting game community's persistent refusal to recognize Smash as one of their own. Many of the largest names in the competitive gaming industry, such as Cloud 9, Team Curse, and Evil Geniuses, began sponsoring Melee's top players, creating further growth and interest from other members of the gaming community. Nintendo was initially extremely hostile towards the competitive Melee scene, as showcased by its attempt to block the streaming of the Melee portion of EVO 2013 (and, as later discovered, to shut down the event entirely). However, 2014 saw a completely unexpected turnaround, as Reggie Fils-Aimé of Nintendo of America made a guest appearance through video at EVO 2014 just a year later, congratulating the tournament's top eight finalists, and the company has even sponsored tournaments such as Apex 2015. 2014 also marked the release of Super Smash Bros. 4 for the newer Wii U console, but the game's release had no real effect on attendance for the Melee scene, as the Melee fanbase continued to play the older game instead of moving onto Smash 4 due to the latter game having slower and less technical gameplay, much like the heavily criticized Brawl (but not to the same extent). Since Smash 4's release, Melee has continued to set new attendance milestones; Apex 2015 broke the 1,000 entrant mark in the winter of 2015, and EVO 2015's 1,869 entrants topped even its previous years, setting a record for the largest Melee tournament of all time. While The Five Gods had continued to dominate Melee majors in the new era, notably featuring Mango's two wins at EVO 2013 and 2014, Leffen and Plup had emerged as true challengers to them, and are the only two players who have defeated all five in a tournament set. Following his rise in 2014, Leffen won B.E.A.S.T 5, marking the first non-God victory at a major with at least two in attendance since 2008; he won his first American major, CEO 2015, that same year, with three of the gods present. He has also won Get On My Level 2016, defeating four gods all in a row without dropping a set. Plup became the second player after Leffen to win a major with two or more gods in attendance, taking DreamHack Atlanta 2017 over Hungrybox and Mew2King; he would go on to win GENESIS 5, winning over Mango and Armada, and double eliminating Hungrybox. There are several players whose level of skill lies just below the top players; Wizzrobe, aMSa, and Axe are currently the players most commonly considered the "demi-gods". These three players are known to frequently earn high placings in large tournaments, as well as for occasionally taking sets off of the gods and Leffen/Plup, but have yet to achieve the skill level or consistency of the players above them. In addition, Fly Amanita and Wobbles have each taken sets off of four of the gods, except for Armada. Westballz, Axe, Shroomed, PewPewU, SFAT, ChuDat, and aMSa have each beaten three of the gods. Moreover, the Melee metagame has seen a major shift towards Fox, the current undisputed best character in the game, sitting at the #1 spot on the tier list. Fox's incredible speed, mobility, combo ability, and KO power has given him a major increase in popularity far above the rest of the top tiers. Many former mains of other characters have picked up Fox as a main, attempting to improve their results by playing a more tournament-viable character. Most notably, Armada picked up the character to complement his Peach, while Hax switched over completely from Captain Falcon. *Mew2King forfeited in losers after losing to PPMD at Pound V and Wobbles at Apex 2012. **Mango was sandbagging under his Scorpion Master alias. At EVO 2018, Swedish Delight was able to defeat Armada early in winners bracket, becoming the first player outside of the gods and Leffen/Plup to do so since Amsah in 2010 at Pound 4. Armada would later go on an impressive losers run, including wins over Mew2King, Mango, Hungrybox, and Plup, but would end up falling to Leffen in Grand Finals, who was able to overcome his demons of placing outside of top 4 and win his first Evolution title. At Shine 2018, Zain became the third player to win a major over two or more gods, taking Shine 2018 after defeating Mango and double eliminating Hungrybox. Due to his consistency throughout 2018 and his ability to take multiple sets from Plup/Leffen and the active gods (with the exception of Armada and Mew2King), Zain is widely considered to be a potential challenger to the gods. Armada announced his retirement from Melee singles on September 18th, 2018, making him the first out of the Five Gods to formally retire. Coupled with PPMD's ongoing hiatus since early 2016, this prompted discussion as to whether the era of the Five Gods was over. On December 7th 2018, Melee gained its third sequel, Super Smash Bros. Ultimate, and a lot of top players (notably Leffen, Armada & Rishi) have shown great interest towards the game because of the changes to the engine. On February 27th, 2019. Melee was excluded from the EVO 2019 lineup. This page was last edited on April 5, 2019, at 03:27.